Creating and maintaining great procedures is important for hazardous waste small quantity generators to effectively manage their waste streams and minimize the risk of state and federal fines. One of the most crucial practices that your company can do is establish, perform and document weekly inspections of hazardous waste storage areas. A regular and through inspection will quickly reveal small problems that are easy to fix and prevent them from turning into large problems that are time consuming and potentially costly to repair. If hazardous waste is accumulated in containers, a generator must comply with Title 22, Cal. Code Regs., division 4.5, chapter 15, article 9 (Use and Management of Containers). Inspections should be done once a week ideally on the same day. Being consistent and following through are critical, so you should evaluate your workflow and pick one day of the week that this can be accomplished. Once you pick your inspection day you will need to have both a designated inspector and a back-up inspector to ensure that you will never miss a week. Both of these employees must be trained on proper procedures and must fill out an inspection checklist documenting that these inspections have been completed. 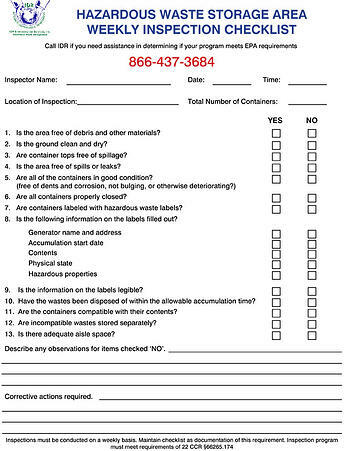 Record your weekly inspections in an inspection log. Is the area free of debris and other materials? Is the ground clean and dry? Are container tops free of spillage? Is the area free of spills or leaks? Are all containers properly closed? Are containers labeled with hazardous waste labels? Is the information on the labels legible? Have wastes been disposed of within the allowable accumulation time? Are the containers compatible with their contents? Is there adequate aisle space? Is the following information on the label filled out?